The Equine Land Conservation Achievement Award, established in 2017 in partnership with United States Dressage Federation (USDF), recognizes individuals or organizations for outstanding achievement in protecting land or access to land for equine use. The award was established to help increase awareness of the importance of land conservation in the dressage community and to serve as inspiration to others within the discipline. Nominations for the award, which recognizes an individual or organization for outstanding achievement in protecting land or access to land for equine use, are due in August. Award nomination forms may be found on the USDF website at: https://www.usdf.org/awards/service/. 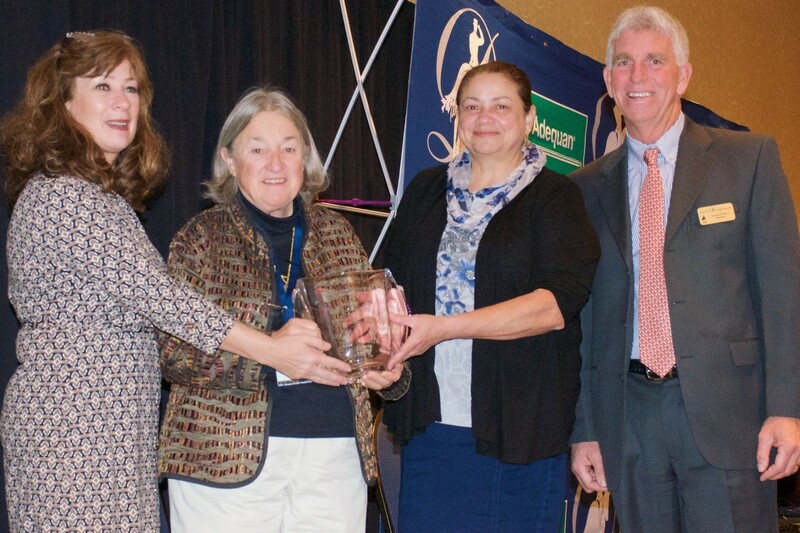 Caroline MacNair Carl (2017) Caroline MacNair Carl was posthumously honored with the 2017 Equine Land Conservation Achievement Award at the USDF Board of Governors General Assembly, held during the Adequan®/USDF Annual Convention, in Lexington, KY. The award, presented by Equine Land Conservation Resource and United States Dressage Federation, recognizes an individual or organization for outstanding achievement in protecting land or access to land for equine use. Caroline was a Raleigh, NC, native, horse enthusiast, and owner of MacNair’s Country Acres, a horseback riding stable that has served the Raleigh community and beyond for almost 50 years. In 2007, the Triangle Business Journal honored Caroline for her equestrian school and farm accomplishments, citing MacNair’s Country Acres as one of the very few agricultural businesses to receive a Women in Business Award. Additionally, in 2008, the City of Raleigh awarder her its Sir Walter Raleigh Award for Tree and Landscape Preservation and, in 2012, the Environmental Preservation Award, in recognition of her manifold accomplishments in open space and watershed conservation. Established as a riding camp and public stable by Caroline’s mother in 1965, MacNair’s Country Acres currently offers a full range of riding instruction, as well as access to show competition, nationally acclaimed clinics, and one of the largest equestrian 4H Club chapters in the state. MacNair’s is now located about a mile south of its original site, on some 200 acres, located on the western flank of North Carolina State University’s 1,100-acre experimental farm. This land is vital to the agricultural education mission of the land-grant university, and its mission is greatly enhanced by a partnership with the non-profit Yates Mill Associates, who have restored the 250-year-old Yates Mill on Steep Hill Creek, at the southeastern point of the research farm. In order to protect her and her husband Bill’s equestrian arts and environmental legacy, Caroline installed conservation easements on the acreage adjoining Steep Hill Creek, and along the streams and ponds on the remainder of the farm. This act of environmental stewardship will help to ensure that MacNair’s Country Acres’ natural equestrian lands, just south of the Raleigh city limits, continue to vividly recall the Wake County agricultural landscape of the 19th and early 20th centuries.